We love our pets, but sometimes they can bring unwanted pests into our homes — and even our businesses. If you’re dealing with Cape Cod flea infestation, call on the experts at Pest Pros. We have been serving Cape Cod home and business owners since 1999 with our fast, dependable and planet-friendly services. We understand that a flea infestation on Cape Cod represents a serious and urgent issue for the home or business owner, which is why we always respond with the utmost urgency to each call for service — anytime, every time. Make sure you’re getting the best in control, eradication and flea prevention on Cape Cod when you choose the team at Pest Pros. If your home has ever been infested by fleas, you know just how bothersome theses pest can be. While they are small, they cause major issues throughout your home by multiplying quickly and biting any flesh in sight. Flea bites are rarely felt. However, they cause irritation to the skin which causes scratching and pain. 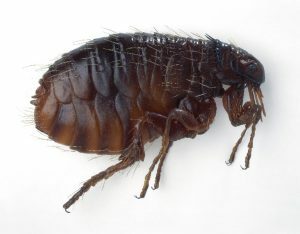 Fleas are most often carried into your home through pets and once they enter, they are difficult to remove. If you begin noticing small red itchy bumps on your legs, it is possible your home is infested with fleas. Call us as soon as you believe an infestation has occurred and our team of experts will remove the fleas quickly! Our service area includes all of Cape Cod. We can serve as your flea exterminator in Plymouth, Falmouth, Yarmouth, Hyannis, Chatham, Barnstable, Wareham, Dennis, Orleans, Duxbury, Scituate, Kingston, Marshfield, Sandwich and other towns throughout the area. At Pest Pros, we offer free inspections and estimates before work begins so you have the fullest possible picture of what your flea situation requires. We also offer affordable rates and green solutions, which ensures you get safe and valuable service. Make sure you have the best flea exterminator in the area when you call on the experts at Pest Pros. Contact us today for a free inspection or estimate to serve as your flea exterminator in Hyannis, MA or the surrounding areas.